thanks to the charm of DtO (and the great generosity of Canadian Opera Company), we got nearly front-row seats to see Ariadne auf Naxos last night. 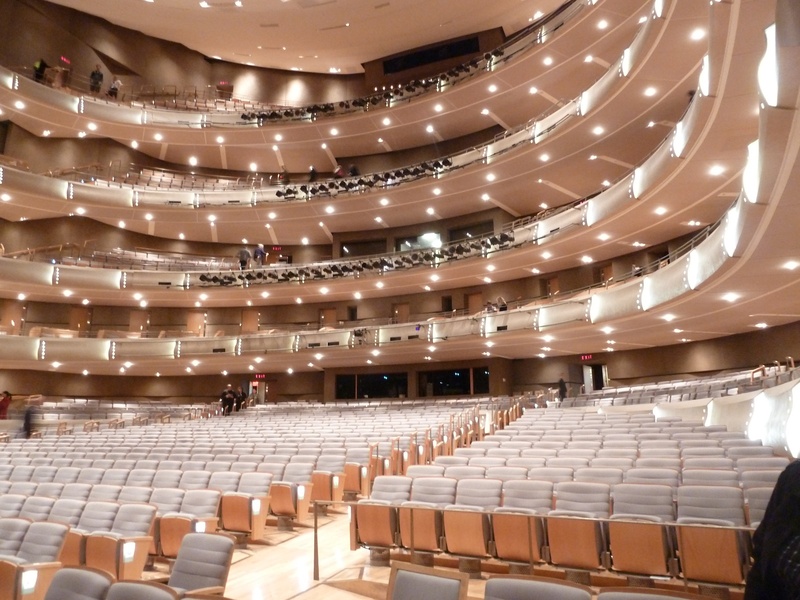 Before i go into the opera, the singing, the singers… let’s talk about the Four Seasons Centre for the Performing Arts itself!! I overwhelmingly impressed!! Unlike the gigantic halls I’m so used to seeing in the US (read my complaints last month in San Diego), I can see the walls inside the house! If you don’t know what I mean, have a visit to Dorothea Chandler Pavilion in Los Angeles or worse the gigantic auditorium in San Diego. From row “O”, i could read the word “ALARM” and see the small flame in the little red sign onstage (part of the staging). Aside from my 19th-row standing room at the Wiener Staatsoper, this is by far the closest i’ve ever been to the stage. wow! like! can see the singers blinking! I turned around expecting to see endless rows of seats behind me, but NO, i see the wall!! there’re only 20 rows of seats. Will do some counting in term of horizontal number of seats today. There’re 5 levels, each with nice views and according to DtO very nice sound as well. Then there’s of course the nice “standing room” near the center (not sure if exists at all levels above ground) with a little railway obstruction. All in all, I’d say it’s a bit smaller or equal in size on the ground level to the Nationaltheater in Munich. The five levels each has less seats and are lower in relative elevation (smaller Dh) compared to those levels at the Nationaltheater. The view on the side seats should be superb for those (me) who want full view of the orchestra. As always, the more to the side you are, the less depth you’d see of the stage. There’re overhangs on all levels above ground except the top. I very much dislike these overhangs and would avoid them altogether (though I can’t voucher for the sound quality yet…). For me personally, I’d try to get the side seats (but not extreme side) and if i can’t get all the way to the top level, everytime if I have to buy my own ticket. 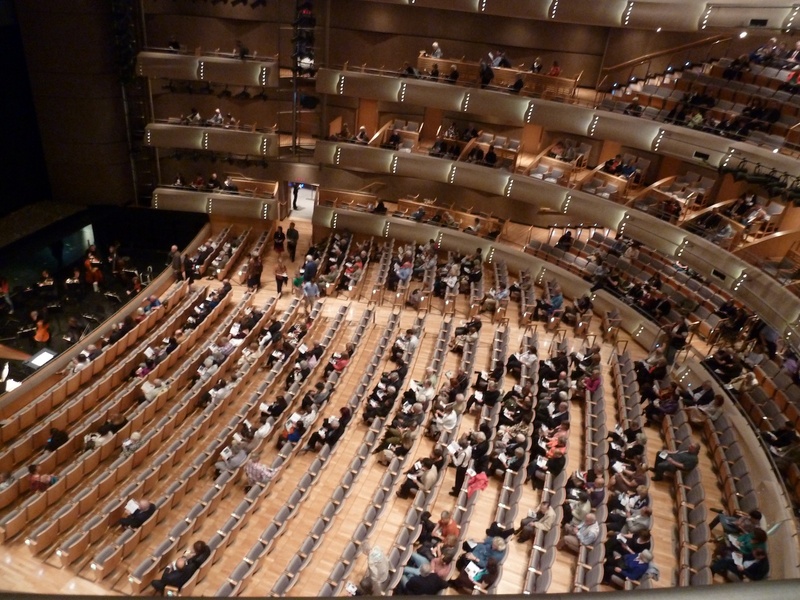 And I’d consider flying in more often to see operas here simply because of the design and size of the hall. So, now that i’m partially done with gushing over the wonderfully small and beautiful hall, let’s talk about I get to see and hear from the singers _and_ orchestra! Unlike Der Rosenkavalier, Ariadne auf Naxos is quite short. I’m not familiar enough with the music to say much about the conducting, but since it’s short, everything is moving along timely. It’s nice to see Alice Coote up close. I like her voice, but because i’m unfamiliar with the opera (why didn’t she sing Orfeo instead?? why? oh why? ), it’s hard to say much more. Adrianne Pieczonka’s voice is quite warm and big. I like her voice but again she’s singing this soprano diva role of oh i’m dying please can some tenor come to rescue me, which is not really up my alley… so am afraid i can’t be very objective here. Zerbinetta, on the other hand, is verrrrrry nicely done by Jane Archibald. She owned the stage with her electrifying and charming singing AND acting. now i see all the hype about Zerbinetta. The rest of the cast all sing well but i’d looove to hear more from mezzo Lauren Segal. anyhow, i also got a nice “media kit” cd, let’s see what’s in there while i wrap this up (and waiting for my darn continuously delaying flight…). Oh, some VERY nice photos. I think i can post them all here since they gave them to me! If someone knows otherwise, please inform me and i’ll remove everything promptly.